Similarly, in chapter 2, Scruton offers a helpful review of some literature about climate change. He rightly identifies the problems of global-warming alarmism, while recognising that global temperatures increased during the last decades of the twentieth century and that burning fossil fuels was a major cause of these increases. Scruton acknowledges other causes of climate warming, including the changing impact of the sun, and recognises we need further research before we can understand the reasons for temperature changes. However, he gives ground to the global warming alarmists; 'Even if the alarmists are overstating their case, therefore, these possibilities are so dire that we are bound to consider how they might be averted', he writes, suggesting 'some unimaginable feat of geo-engineering' (p. 54). It is positive that Scruton embraces adaptation to climate change, including geo-engineering and risk-taking. Yet his interpretation of risk also includes weaknesses. In chapter 4, he provides a useful critique of how risk avoidance disables positive energy responses, as well as undermining resilience through the application of the precautionary principle (especially in European Union laws). Nevertheless, Scruton believes risk can be managed by balancing costs and benefits, which reduces risk to technical management. This interpretation fails to appreciate that risk is a political problem that involves resolving different political interests based on risk-taking or risk-aversion and whether we prioritise human interests or the environment. Moreover, Scruton demonstrates that he has not grasped how these conflicting interests are now at the heart of politics. Instead of analysing environmental issues in terms of the contemporary clash between modernisation and environmentalism, Scruton attempts to situate these issues within the political discourse of left and right that stretches back to the French Revolution and dominated the twentieth century. He defends his own conservatism by criticising the left using the poor treatment of the environment by Cold War socialist states. At times, this verges on the ridiculous, as when Scruton notes 'the waste piled up in every field' in socialist Romania (p. 367). More importantly, Scruton is weakening his case by attacking a straw man here, as few would defend the environmental record of Cold War socialist states. In addition, Scruton contrasts left and right by distinguishing between conservative (right) civil associations and radical (left) non-governmental organisations (NGOs): 'The most influential agenda-driven NGOs are powerful, largely unaccountable, and unable to discuss the validity of their goals, since they are defined in terms of them; civil associations are, on the whole, unconcerned with political power, accountable to their members, and able to adjust in response to criticism.' (p. 35) While Scruton raises some legitimate criticisms of NGOs like Greenpeace, Friends of the Earth and Earth First!, his distinction between civil associations and NGOs lacks clarity. As his inclusion of the caveat 'on the whole' hints, his conservative civil associations are not the most democratic or apolitical organisations. For example, he cites the National Trust as a positive civil association, despite its dedication to preserving aristocratic estates. While there is nothing wrong with conserving these important sites of English heritage, can anyone seriously believe organisations like the National Trust are 'unconcerned with political power, accountable to their members'? Also, it is unclear why some of the civil associations Scruton describes as conserving the English countryside should be described in this way; have the Women’s Institute (p. 342) and the Anglers’ Co-operative Association (p. 161) really been dedicated to protecting nature? According to Scruton, 'Hunting, shooting and fishing create an interest in other species and a desire to conserve their habitats that is matched by virtually no other relation between man and animal' (p. 163). Come on, Roger, you could defend these activities as sports, but not for conserving other species! The common ground between Scruton’s conservatism and radical environmentalism is most clearly demonstrated by the question of consumption. 'In fact, it is precisely in the fight against consumerism that left and right should be united, establishing an alliance on behalf of the environment that would also heal the rift in our civilisation', suggests Scruton (p. 246). Scruton explains that the real problem is not oil companies, car manufacturers, logging corporations or supermarkets, but the demand for their goods (p. 17). 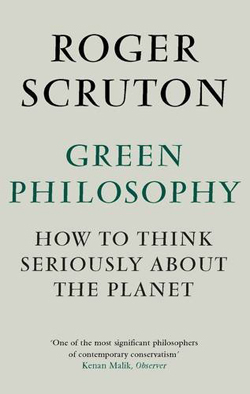 Despite his criticisms of environmentalists, Scruton says 'one can naturally sympathise with those Greens who warn against the culture of greed, and who see the market as an expression of it' (p. 140). Inevitably, this leads to Scruton calling for 'a brake on our appetites' (p.13) and 'not more growth but less' (p. 15). Scruton blames the consumers of energy, rather than the producers, as 'ultimately responsible for greenhouse gas emissions' and argues 'by taxing consumption we create the best incentive to reduce production' (p. 392). For Scruton, global warming has the benefit that 'Like original sin, it weighs on us all, and like original sin it might seem to require a salvationist solution. Moreover, it connects immediately with the sins that mean most to egalitarians and with which many conservatives too are far from happy: consumerism, the luxury lifestyle, the obscenities of waste.' (p. 87) Scruton deploys the global-warming sin against some forms of consumption: 'Climate change hovers above the sinner in his sports utility vehicle like a vision of judgement' (p. 87). Yet Scruton's 2009 book ‘I Drink Therefore I am’ celebrates drinking wines that cost £1,500 a bottle and an identity based on consumption which is somehow not part of the luxury lifestyle many conservatives apparently dislike. Taxing carbon emissions and 'charging proper tolls roads' (p. 396) are specific recommendations made by Scruton. Indeed, in the last paragraph of his concluding chapter Scruton boldly states: 'A regime to price roads, waste and packaging so that the cost falls on the user will hurt everyone, and will be useless if not imposed uniformly by the state.' (p. 402) It is true that such measures could hurt everyone, but not everyone equally. Taxing energy consumption, road use, waste and packaging will raise costs that will be harder for poorer people to pay than the rich, even if wealthy people would pay more because they consume more. Scruton draws on his expert knowledge of the philosopher Immanuel Kant to support his critique of consumption: 'For the Kantian, duty is all encompassing, and the pursuit of happiness subordinate to it.' (p. 409) Moreover, he points out that for Kant people are not motivated only by self-interest, but also by a conception of their place in the world (p. 202). In addition, Scruton approves of Edmund Burke’s emphasis on protecting future generations through tradition, respect for the dead and volunteering in civic, local associations (rather than environmental NGOs). These insights are built into Scruton's concept of oikophila, which he describes as 'the love and feeling for home' and defending 'local initiatives against global schemes, civil association against political activism, and small-scale institutions of friendship against large-scale and purpose-driven campaigns' (p. 3). Oikophila is contrasted to 'oikophobia (the repudiation of the home), from technophilia (the urge to obliterate the home with functional appliances), from consumerism' (p. 27). Again, this has a great deal in common with green celebration of the local and philosophically is remarkably un-innovative. To make matters worse, Scruton argues that human beings can only be rational when faced with local and clearly defined problems: 'It is of course true that human beings reason in means-ends ways when faced with practical problems - provided the problems are sufficiently local, the solution sufficiently near in time, and the goods affected (including the preferences and interests of those who need to be taken into account) sufficiently defined' (p. 193). Here Scruton undermines Kant’s emphasis on universal human nature, from which local experience can be understood: 'Kant was the prophet of "Enlightenment universalism". He believed in a single, universal human nature, to which appeal should be made when examining the legitimacy and authority of our local arrangements', writes Scruton in his book, Kant; A Very Short Introduction (OUP, 2001, p. 114). To be fair, Scruton acknowledges his diminished view of humanity: 'I respect the Enlightenment conception of the human being, as a rational agent motivated by universal principles. As a conservative, however, I bow to the evidence of history, which tells me that human beings are creatures of limited and local affections' (p. 36-7). Scruton's failure to develop his understanding of classical philosophy to offer a distinctive or new approach is particularly disappointing given he appreciates the power of classical philosophy: 'Wisdom, of the kind we learn from Aristotle, Epictetus, Confucius or Aquinas, does not consist in "solutions" to everyday dilemmas, but rather in a comprehensive stance towards the world, through which we frail beings can make the best of our limited powers.' (p. 186-7) Nevertheless, he rightly argues that classical philosophy provides a viewpoint on the world that is lacking in the field of environmental ethics. Scruton criticises utilitarian attempts (for example by Tim Mulgan) to introduce consequentialist reasoning into environmental protection based on the needs of future generations, which he points out we cannot know (p.189). Scruton lambasts the new environmental ethic, which seeks to escape old moral reasoning by rejecting anthropocentric approaches because they fail to extend our duties to animals and the Earth as a whole. As Scruton describes, there are several varieties of 'the attempt to develop a "new ethic" in which the anthropocentric reasoning that has hitherto held our species captive is somehow left behind, to be replaced by reasoning that is "biocentric" (EO Wilson), "geocentric" (James Lovelock), "ecocentric" (Aldo Leopold, Holmes Rolston, Arne Naess) or even "physiocentric" (Meyer-Abich)' (p. 195). Scruton is sympathetic to the 1974 work of the Australian philosopher John Passmore, who developed an anthropocentric approach that we should look on nature for our sake, rather than for nature's sake. Passmore believed that nature is a source of intrinsic rather than instrumental value, but, as Scruton observes, 'it is only from the point of view of human interests that intrinsic value exists' (p. 197). Although Scruton makes many perceptive criticisms of environmental ethics, he has not appreciated key shifts in environmental thinking. As previously discussed, he identifies the emergence of conservationism in the nineteenth century yet asks, 'But surely things have moved on, and moved in the direction of doubt and hesitation?' (p. 243). Even though Scruton notes some vital moments impacting environmental thinking, including Rachel Carson's 1962 Silent Spring book, he does not trace how green organisations have evolved. Crucially, he does not investigate how many traditional conservationist organisations embraced a broader environmental agenda that led them to move beyond protecting nature to addressing wider social and economic issues. Scruton does mention the popularity of the sustainable development agenda in the 1980s, but does not appreciate how this encouraged green organisations like the WWF to move away from traditional conservationism; across Europe the WWF expanded its campaigns beyond animal protection to opposing development, nuclear weapons and carbon-intensive energy. This means that Scruton fails to appreciate that nineteenth-century conservationism was transformed into environmentalism by the late-twentieth century. For a philosopher, this oversight has profound implications. Nineteenth-century conservationism was based on the separation of man from nature with conservationist associations advocating human protection of nature and preserving monuments and places of natural beauty. Since the Enlightenment, the dichotomy between man and nature had been based on the distinction between the subject (humanity) and the object (nature), which man could seek to know, control and protect. During the twentieth century, this distinction was eroded by integrating natural and social concerns. Increasingly, the focus was on their mutual dependencies and interrelationships. Between the 1970s and 1990s, a holistic environmentalism evolved that views man and nature as one. Scruton does not explain this significant change, but he does sense it has happened: 'The earth must become part of each of us, not an object but a subject… The transformation of the earth is the transformation of ourselves.' (p. 289) Descriptively, this speaks to a world in which the dichotomy between nature and society has been lost. However, for a philosopher who appreciates the importance of the distinction between subject and object and who defends conservationism, there is a bigger problem: rejecting this distinction also means losing our sense of human subjectivity and how that can be deployed to protect and conserve nature. Dominic Standish lectures in environmental sociology for the University of Iowa and is the author of ‘Venice in Environmental Peril? Myth and Reality’ (2012). This is his website and blog: www.dominicstandish.com. He will be speaking at the Manchester Salon debate ‘Modernisation, development and conservation’ on 24 April 2013.